It should be no secret at this point that from time to time I do enjoy watching a movie that is...shall we say not an award winner. Sometimes I just like a big ol' actiony-blowup-FU-athon. 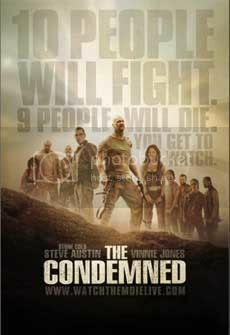 Which is exactly what I was expecting when I popped “The Condemned” into my DVD player. What I ended up with was a movie full of potential that fell quite short of my expectations. This is a total shame because I had really high hopes for ”Stone Cold” Steve Austin. A man who I believe has the talent to make the switch to main stream entertainment ala The Rock. So what went wrong? There was plenty of back story which wasn't even laid out all that terribly but this isn't a storyline kinda movie now is it? Is it?? No, this is an action packed fight to the death on a remote island type of movie. That's all the story you need to know! But like I said the “story” stuff I didn't have a problem with. I only expected it to set up the carnage, which it did. THAT is where things come took a bit of a dive. Take note, this is a WWE film. What does that mean? Well to me it means that the one thing that they should be able to have done right in a movie is the fight scenes, I mean hell one the companies main job is basically filming fight scenes. So why they allowed director Scott Wiper to film all of the fighting scenes in the style of someone holding a camera while falling down Springfield Gorge we will probably never know. I want to see some blood laden, sweat dripping, swear inducing fights, I don't want to succumb to motion sickness. On top of that it most of the “contestants” ended up eating it in the exact same way. Using the C4 laden ankle bracelet to kill one or possibly two of the competitors would have been fine, I don't even mind the bit at the end, but come on enough with the boom boom already. Although I guess I shouldn't be that upset about the use of the C4, after all if everyone had been finished off in a unique and entertaining way I may have missed it, what with the camera's doing the constant gymnastics during those scenes and all. Just a few other smaller gripes I had. 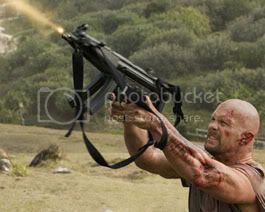 Since he is the star of the movie how about giving Steve Austin a little bit more to say and do. I know they angle they went with for the character was he didn't talk about himself (or anything really) but it seems like he could have had more, everything he says doesn't have to be some sort of catch phrase. In the end I'm glad I watched it just to say that I did but in the future when I'm craving something of this sort I'll stick with Battle Royale. Wow its been a while eh? Worry not, I only took a bit of time off for illness and time reasons. I'll be back on track soon enough (if not I promise I'll personally flog myself in public...which would be strange). I haven't even had the time to go through my normal one to two movies a night lately. I've gotten a few down though, "A Nightmare on Elm Street 2" and "Halloween 2" I believe were the last two. "A Nightmare on Elm Street 2" on the other hand, well I was underwhelmed by the first in the series so my hopes for the sequel weren't high. About the best thing I can say about it is that I got through it and now I can finally watch part 3 which I hear is fun enough. Don't get me wrong the first in the series was fun enough. The real question I kept asking myself through these movies was "Why was I afraid of these movies as a kid?" "Diane, Lee Jay and Weezy are talking about people, relationships, conflict, disputes, the law, resolution, problem solving, and everything that makes us love, makes us hate, makes us angry, makes us understand and makes us human." In other news, this video is much more interesting and entertaining than me. *Yes I'm aware about the "Halloween 3" situation. I was being ironical. If I had been even a quarter as good as Mindi Abair I probably never wouldn't have given up my saxophone so easily. How freaking awesome is this?